"He lit the gas, melted the butter, poured in the eggs, and let them run all over the base of it. Her eyes followed everything greedily, watching him pull the eggs up into soft ridges in the center as they cooked and tilt the pan to let raw egg flow into the space. She watched him, too, looking at his face and his working hands and his bare shoulders and his feet. When the omelette was cooked he folded it over and cut it in half with the spatula." It's my second time reading the second book in this wonderful trilogy, and I didn't remember this part at all. I was so excited for Lyra to taste those eggs. Oh, to have one's first omelette again! It's like reading one of your favorite books again and experiencing that joy all over again. This phenomenon is what I call a "forever first"—something that feels like it's going to change your life now that you know it exists...except here's the thing: You've actually had it before. It's like the old-yet-new butterflies in the stomach we all hope to find from a life partner. Runner's high is another good example. Runners have felt this sensation before, but they aim to experience it again and again...and every time feels as good as the first. Everyone knows I love eggs. Alas, even an expert (eggspert?) egg connoisseur like moi can get tired of having the same ol' hard-boiled, soft-boiled, scrambled, fried, poached, [insert cooking method here] eggs time and time again. I recently fell hopelessly back in love with eggs again, thanks to my spice cabinet. Behold, a twist on an old favorite (the classic Chinese tomato and egg dish). The addition of curry powder or other similar spices really takes this dish to a whole other level. It's almost like a mixed-race couple has produced a beautiful mixed-race baby. A beautiful baby I'd like to gobble down...ha. That sounds wrong. But you know what I mean. Right? You know what? 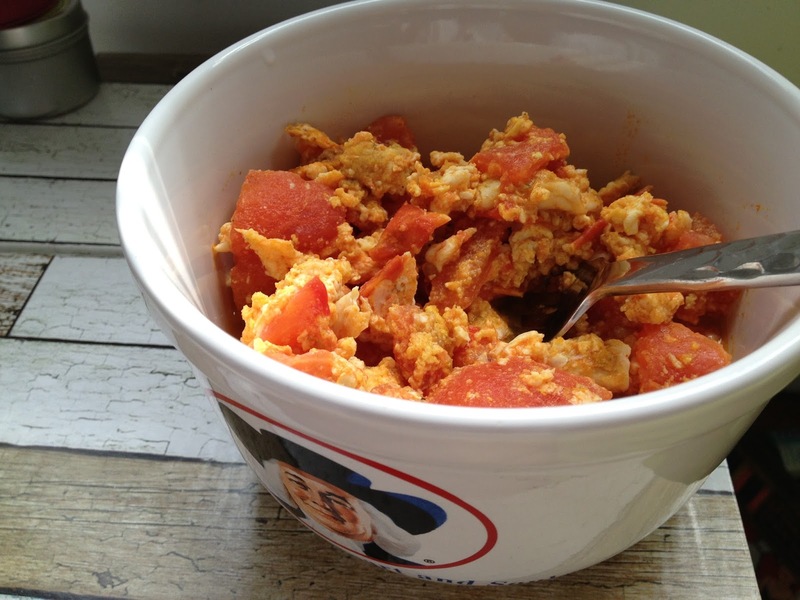 This may just be my favorite version of tomatoes and eggs of all time. And I've made a lot of tomato-egg dishes in my time, so that's saying something. Granted, I ate this dish imagining how much Lyra must have enjoyed her first omelette. Maybe that made it taste better....or maybe it was the spices. Either way, I'm more in love with eggs than ever. Heat a drizzle of olive oil in a nonstick skillet over medium-high heat. Add chopped tomatoes and cook until tomatoes have broken down into a sauce-like consistency (about 5-10 minutes). Add in the eggs and break up the yolk with your wooden spoon. Let sit until it's slightly set, then add in your spices, salt, and pepper (as much or as little as you'd like). Add in the sugar or ketchup if you choose to do so (I personally like to add this to my tomato-egg dishes, since it balances out the acidity of the tomatoes quite nicely). Cook until eggs are just set (no longer jiggly). Chow down.